Boil 2 cups (644 grams) of maple syrup until it reaches . Measure and pour the maple syrup into a large saucepan. Pure maple syrup works best as it has the strongest and most genuine flavour. Avoid using maple-flavoured syrup as this won't thicken correctly and has a weaker flavour. Heat the maple syrup over medium heat until it reaches . Stir the syrup with a wooden spoon as it heats to avoid it sticking to the pan. Take the pot off the heat and wait for the syrup to cool to . Place the pot of maple syrup onto a cold element or a wooden board to cool. Leave the candy thermometer in the syrup so that you can monitor the temperature. Most candy thermometers can be clipped to the side of the pot. Smooth the candies with a knife and then allow them to cool. Use the face of a ****er knife to help flatten the mixture in the moulds. This will help the base of your candies look smooth and professional. 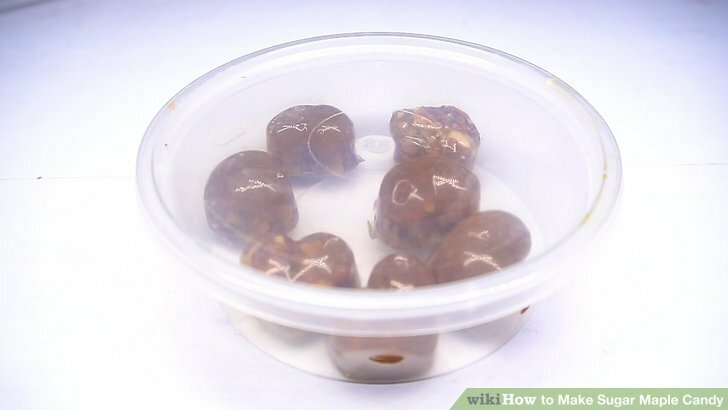 Leave the candies in the moulds at room temperature until they are cold.